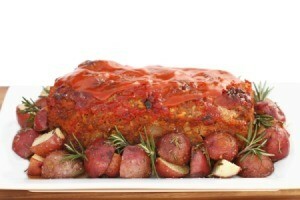 Looking for a twist on your classic meatloaf recipe? Try this sweet and sour meatloaf. It might become your new favorite meatloaf recipe! The Best Sweet and Sour Meatloaf! Mix together beef, bread crumbs, salt, pepper and eggs. Add onion and one half of the can of tomato sauce. Form into a loaf in a 9"x5"x3" pan. Bake at 350 degrees F for 50 minutes. In a saucepan, combine yopping ingredients and bring to a boil. Pour over meat loaf, and return to oven for 10 minutes more. Mix well and mound first 6 ingredients in centre of greased baking dish, leave 1 inch spare on all sides. Combine next ingredients and spread over meat. Bake at 350 degrees F for 1 1/2 hours. Baste while cooking.